I think it got light before 4:00 am, but it wasn’t until 6.30 am that I hauled myself out of my sleeping bag and got my kit back together. 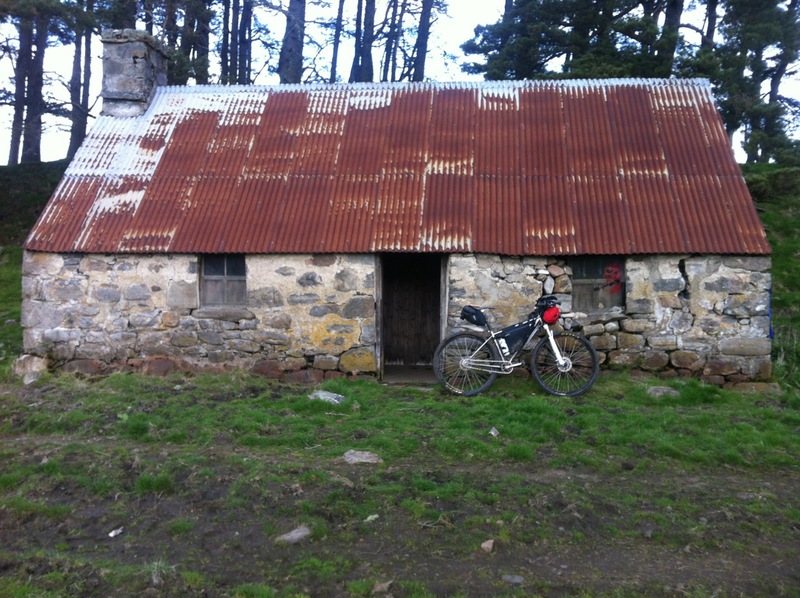 It was a tidy bothy, one I’d be given the details of by a friend via the Bear Bones Bikepacking forum. It was worth having ridden the extra distance to and I felt fairly refreshed even if by only 4 hours sleep. I’d saved a couple of pieces of pizza from the night before, one of which served nicely as breakfast. The start of the day was easy, and on paper today would an easy day. 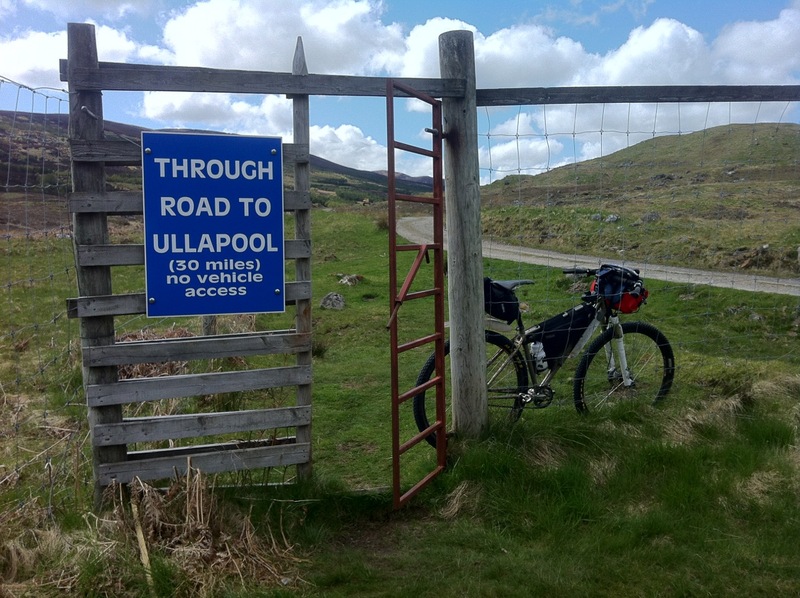 The plan was to ride into the Fisherfield area south of Ullapool and negotiate the river crossing, before overnighting again at a bothy just the other side of the river. I expected to cover a similar distance to that which I’d done on Day 1, but hopefully finish a bit earlier than 2.00 am. Cannich came fairly quickly, and an easy spin along the quiet roads of Strathglass finally brought me to Erchless Castle. A long haul out of the valley and over the top on reasonable quality stone track brought me to Orrin Reservoir, before its tarmac service road led me down eventually to Contin. A stronger headwind than yesterday showed its hand whenever the track turned vaguely westwards, and this would no doubt be an issue for the final section over to Ullapool. I arrived at Contin at about 10:40 am. For reference, the lead group of Aidan, Mark and Phil S got to this point the previous night. I learnt that they’d resumed riding at 7:15 am, so I was about 3.5 hours behind. Hot pies! 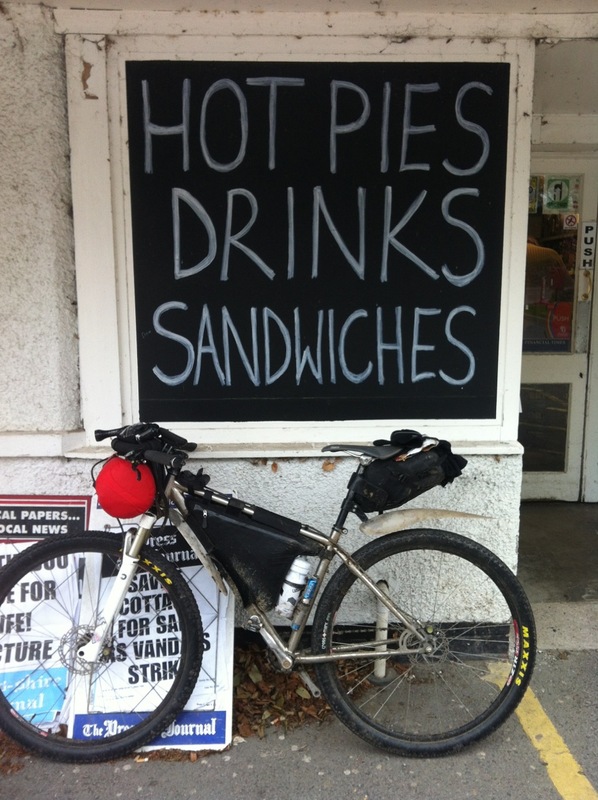 They do HOT PIES! I burst through the door and looked around the shop anxiously for the Hot Pie stand. There was no aroma of hot pies, which struck me as odd initially. Eventually, in the corner, I found the cold and empty Hot Pie stand. I asked tentatively if they had any Hot Pies, but the girl said, “ah, we dinnae ha-enny on Sundaes”. I ventured towards the fridge, found a tuna pasta salad that looked more appetising than the white bread sandwiches, got a cup of hot chocolate from the machine, some crisps and a chocolate bar, and a Coke and some water. Turned out that the pasta was revolting, but I ate as much as I could stomach. Just as I was finishing up, Rob Wixey rolled into view. Turns out that I’d past him on my push up through the woods from Invermoriston the night before. He’d had a hard a day as me yesterday, and was definitely looking in need of food. Thankfully, I’d had the only tuna pasta salad, so he was at least spared of that. 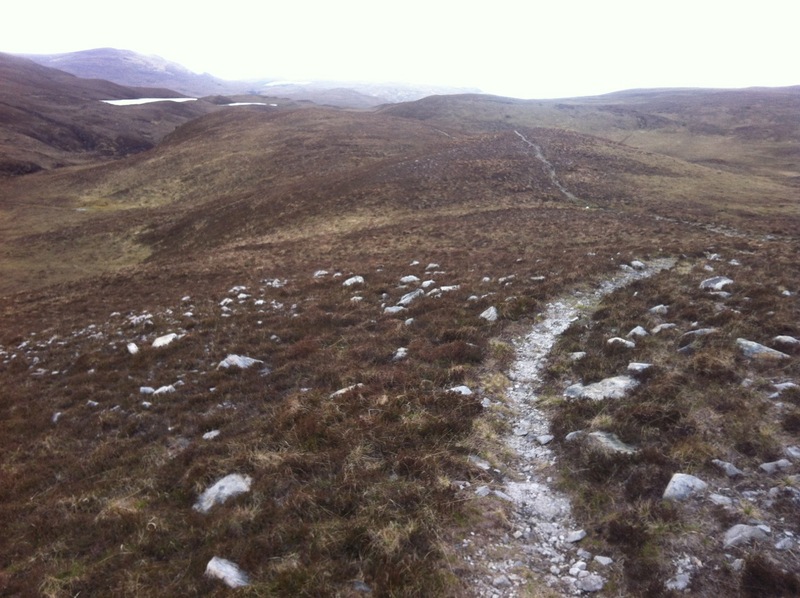 The route continued northwards mainly on forest tracks before climbing out of Strath Rannoch over into Strath Vaich. The track past alongside Loch Vaich before climbing out of the top of the valley and descending into Gleann Mor and on towards Amat Forest. The transition in the landscape between lowland woodland through to high level moorland and back down again was a nice mental distraction. Amat Forest itself was lovely, with sections of native pinewood and birch trees lining the road. Just beyond Amat lay the start of the road to Ullapool. The gate also signified Checkpoint 2, which was one of five points marked on the Trackleaders page that reported the position of each rider on the course, based on the points transmitted by their SPOT satellite tracking units. Analysing the checkpoint splits after the event revealed I was in 6th place at this point. Alan Sheldon had passed me earlier in the morning while I was sleeping in the bothy to gain a two hour lead and 4th place. Phil Richmond wasn’t far in front of me in 5th, perhaps an hour. The road to Ullapool started reasonably enough, following the valley bottom up Strath Cuileannach, before steepening where it turned up Strath Mulzie and making an exit out of the top of the valley. Here the road seemed to loose its definition, becoming a piece of winding singletrack through the heather and becoming quite challenging in parts as it cut across the hillside and into Glen Achall. 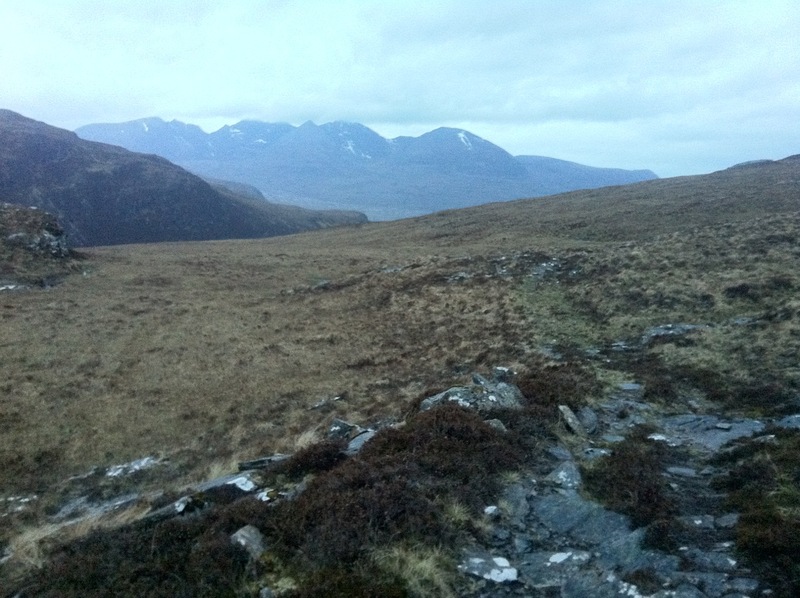 The major difficulties were over with at this point, and I began a long undulating descent into Ullapool, arriving at 6:50 pm, just under 4 hours after leaving Checkpoint 2. In my conversations with Greg May on Day 1, I’d learnt there was a chip shop down by the pier, which is where I headed as soon as I arrived. I’d had my heart set on chips and a chicken and mushroom pie, but it seems Hot Pies are hard to come by in Scotland, especially on Sunday’s, so I settled for a cheeseburger, chips and another can of Coke. This was the halfway point of the race, and all things considered it wasn’t going to badly. I’d ridden a good distance so far today, and there was still the best part of 3.5 hours light left for me to make it into Fisherfield. 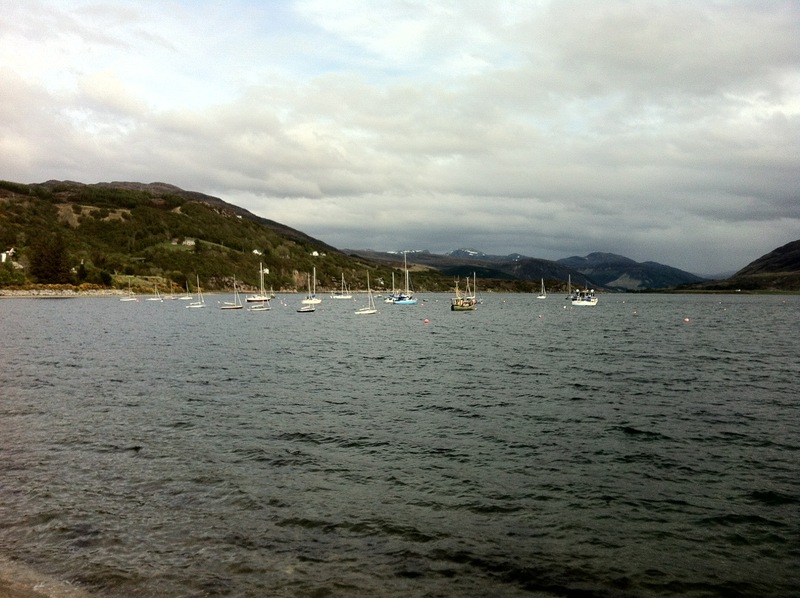 I set off down the road to the end of the Loch Broom. The elevation profile of the route appeared to have a massive spike in it at this point. The route climbs very steeply to pass between the summits of Meall Glac and Meall a’ Chairn, a climb of 400 metres ascent. The initial climb was steep, awkward, partially overgrown with gorse and bramble. It was getting dark, heavy clouds had gathered and rain was a certainty at some point soon. I nearly had my first sense of humour failure here, but just managed to hold it together long enough to get above the thicker vegetation and find more predictable moorland path through which to push my bike. In all it took almost until 10.00 pm to get up to the saddle between the two summits where I could begin to make my descent. The descent was tricky. I found myself in a half-light between light and dark. Low contrast made it difficult to judge obstacles but my lights did little to illuminate things enough to ride at a more normal speed. I edged my way down the trail carefully; these were the perfect conditions to have an accident – tired and with darkness descending. Thankfully, I arrived down at the road in one piece, having kept it rubber side down all the way. 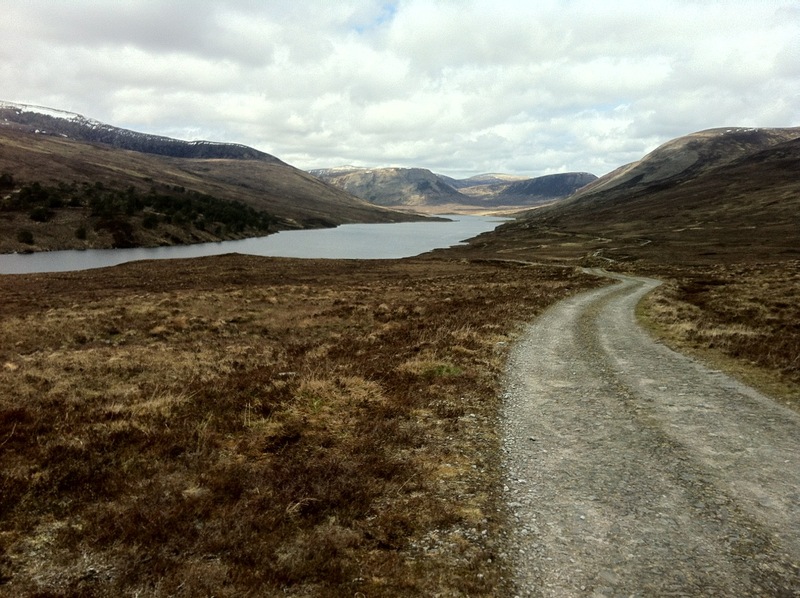 A short section of tarmac provided a link to the beginning of the off road that leads into Fisherfield. This was the crux of the whole route. The main feature, we were told, was a river crossing where the Abhainn Srath na Sealga flows into Loch na Sealga. I specifically wanted to clear this today as heavy rain was forecast overnight that would surely make the crossing more diffcult in the morning. I began the climb into Fisherfield at around 11:00 pm, some 15 hours since setting off in the morning. The climb began on a stone track, partly rideable under tired legs and one gear. I pushed bits and rode bits until the track deteriorated to a narrow rough and loose surface. On the way up, I passed Alan Sheldon, bivvied up under a fallen tree. He told me that Phil Richmond had gone wrong on the previous hill and was stopped lower down. We talked about the river crossing, and my intention to cross tonight instead of tomorrow. I rode on. I was now in 4th. The Fisherfield track became very tough and slow. Long difficult sections pushing the bike between, around and over rocks, each foot placement requiring thought and attention. Eventually, the descent towards the loch began. I found my lights able to illuminate each side of a narrow rocky ravine, and I struggled to man-handle my bike over the rocks, the physical exertions of the day caught up with a long time earlier. Frequently I would catch my leg on one of the pedals, until eventually the bike overbalanced, the rear spun around and the chainring smacked into the back of my right calf. I screamed out in anger and frustration. This was not a place intended for bikes. It’s way past late, I’m tired, its raining. What the hell am I doing this for anyway? But, here I was in the middle of the night, in the middle of nowhere. Back tracking would take as long as carrying on, so carry on I did. Eventually, the flat ground returned. Rocks gave way to bog and I trudged along the soggy ground toward the shore of the loch, before turning 90 degrees to the south west to head for the inlet to the loch. I reached the edge of the river and shone my light across to the other side. It looked a lot bigger than it did in the catalogue. My light just illuminated the far shore, in between was a black rippling vastness of indeterminable depth. The rain continued to fall. It was 2:00 am. I had two options. I could back track through the bog to the Shenavall bothy. That’d probably take me half an hour, and I’d only have to come back in the morning, and who knows I might like the look of the crossing even less in the daylight. Without wanting to dither too long and risk getting colder and wetter, I strode into the water. In a few steps the water rose to my knees. I quickly backtracked. I took my waterproof shorts off and hitched the legs of my cycling shorts up as far as they would go and went back in. The water rose above my knees and nearly to the top of my thighs, stopping just short of getting my shorts wet. Thankfully the current wasn’t strong and the passage was easy enough, even if it did look very daunting. I looked back briefly to see another light descending down the hillside the way I had come. Had Alan had a change of heart and abandoned his bivvy after our conversation? About a mile further on was another bothy, Larachantivore. My lights caught the edge of a building in the distance and I was drawn towards it. I circled the sizeable building looking for the entrance. I found several doors, but each was locked. I couldn’t believe it. What I thought was a bothy was in fact a private lodge, and a well appointed one at that. I was dismayed. I’d ridden for 19 hours for this. I was beyond tired, it was raining and I hadn’t prepared myself mentally for the prospect of putting up my tarp. I spun around to see if I could find some cover from the wind somewhere, and as I did so, my lights caught another small building – an emergency shelter for walkers and climbers, so it said on the door. That would do. As far as I was concerned this was an emergency. The internal space was about 10′ by 6′. Enough for two people to lie down and store their gear. I retrieved what I needed from my bike and got inside, out of my damp clothes and into my sleeping bag. I cleared enough space beside me so that Alan, if it was him behind me, would have some room also. It was 2:30 am. If I’d thought Day 1 was hard, then Day 2 was definitely harder.